The pupils of St Malachy's Primary School, Martin's Lane, Newry recently held a Jersey day where pupils made a donation to wear a football jersey to school. 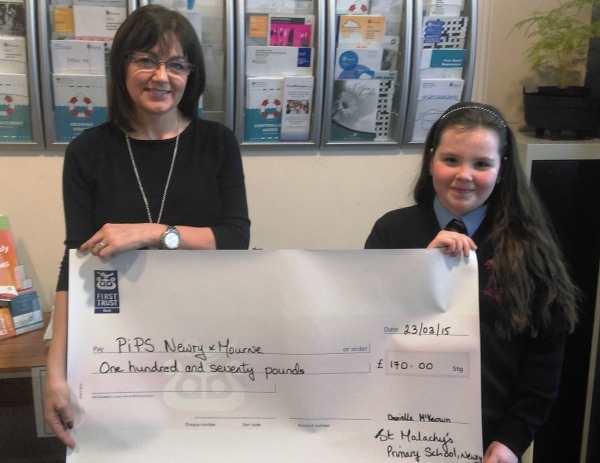 Pictured is pupil Danielle McKeown presenting a cheque for £170 to Dympna Maguire, PIPS Newry & Mourne. PIPS Newry & Mourne would like to sincerely thank the pupils of St Malachy's Primary School for their very kind donation to our organisation.